Discover the benefits of investing in quartz countertops. If you’re shopping for new countertops, you know that granite is still the king of the kitchen. However, there are other options that offer great versatility, reliability, and strength that should be considered right along with this popular option. Check out the benefits of choose quartz countertops for your kitchen remodel. When it comes to strength, quartz countertops can take a lot. That’s because it’s an engineered material that combines natural, ground quartz and polymer resins. This combination will make your countertop almost indestructible. Most natural stone are porous. Some are more porous than others, but they do all absorb some amount of liquid. Quartz, on the other hand, is completely nonporous. This benefit comes from the manufacturing process and can be attributed to mixing the ground quartz with the polymer resins. A lot can happen on your countertops and even the best efforts can sometimes still result in staining and corrosion. Quartz countertops are incredibly durable and resistant to corrosion and staining. 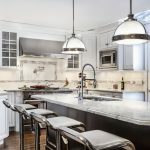 Although you still want to be careful with the heat from your pots and pans, your quartz countertops will resist staining from normal splashes and spills that occur in the kitchen. Although this article is about countertops, quartz is versatile enough to be used in many different applications. It’s flexible enough to be held in place with epoxy instead of screws. This makes it great in applications like showers, kitchen backsplashes, and walls. It’s a heavy stone, so countertops is still one of the best applications for quartz. In addition to its versatile use, it also comes in a variety of colors as pigment can be added to the resin to match and complement any design. Since quartz is not a porous material, it’s much easier to maintain than other options. The polymer resin means that it doesn’t need to be sealed. All it needs is your routine cleaning to maintain it’s condition and great looks. This entry was posted on Friday, September 14th, 2018 at 2:46 pm. Both comments and pings are currently closed.